Using the proper blood pressure measurement instrument is necessary, especially for people who are at risk of having abnormal blood pressure levels. The blood pressure reflects the force which drives blood along the blood vessels in the circulatory system. To monitor the blood pressure, it is important to use aproperly calibratede quipment which can detect abnormalities that may lead to potential complications. 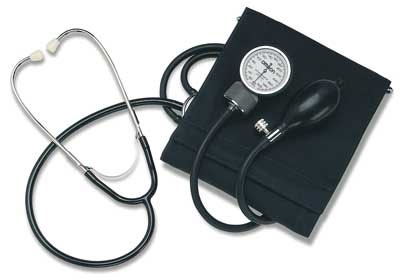 To measure your blood pressure manually, you will need a sphygmomanometer and a stethoscope. This instrument is often called by laymen as the "blood pressure (BP) cuff." You will find different types of BP cuffs in use. One type is attached to the wall (usually near a patient's bed in the hospital), but most BP cuffs are portable. These devices basically work the same way, and have the same parts—the bladder, which is connected by a tube to the bulb that has a release valve, and a pressure gauge, which is either ananeroid or mercury type. Bladder. The bladder (or cuff) is an elongated rubber bag enclosed in non-slip fabric that wraps around your arm and is pumped with air when blood pressure is being taken. Some cuffs, instead of non-slip fabric, have snaps or other materials that secure the bladder. Hand bulb. The bulb is used to manually inflate the bladder with air by repeated squeezing. Air does not flow back into it when released. Instead, it refills with air coming from outside the bulb. Rubber tubes. The bladder is connected to the handbulb by a rubber tubing, where air passes during pumping. Another tubing connects the bladder to the pressure gauge. Release valve. A release valve or screw is used to release air from the inflated bladder. When tightened, air is prevented from escaping. Gauge. The gauge indicates the air pressure in the bladder. A gauge may be one of two types—mercury or aneroid gauge. Both have scales that measure the air pressure in millimeters (mm) Hg. Mercury gauges have glass tube columns with mercury that measures air pressure in the inflated bladder. A scale at the side of the glass tube is read as you release air from the bladder and the column of mercury descends. While, aneroid gauges look like circular dials with a needle that rotates along a scale that is equivalent to that of a mercury gauge. As air is released, blood pressure is indicated by the needle which moves counter-clockwise. Diaphragm. It could be a flat disk or bell that picks up sounds produced by the heart, the lungs or the arteries. Tubing. They are hollow metal tubes which are connected to flexible rubber tubings that transmit sounds from the diaphragm to a pair of earpieces. Earpieces. They are twisted metal tubes which are connected to plastic pieces used to protect the ears while one listens to the sounds transmitted from the diaphragm. Automatic monitors, also known as electronic or digital blood pressure monitors, are battery-operateddevices which use microphones to detect pulsations in the artery. Inflation of the cuff wrapped around the arm inflates and deflates automatically when the “start” button is pressed. 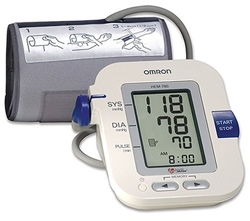 This type of BP monitor may be found in pharmacies, supermarkets and shopping malls. When using automatic BP monitors, avoid those which measure blood pressure from the finger or wrist since they are not accurate. This is a small device worn for 24 to 48 hours to take your blood pressure automatically throughout the day. This is used for people who have inconsistent BP readings. It gives a complete picture of blood pressure fluctuations. The cuff on the arm is attached to another device worn on the waist, which records readings regularly. Some models transmit the readings to medical personnel who monitor your blood pressure results almost in "real time." These monitors make BP measurements repetitively at regular time intervals and often include other vital signs and alarms. Designed for bed-side BP monitoring in clinics and hospitals, they provide accuracy but are often expensive. These devices make single measurements and may record other vital signs. They are popular for routine clinical use as well as general ward applications. These devices make single BP measurements only and may be used for home monitoring as well as in clinical practice.